Conference Consultancy Anna Mantel (Hartmann) accompanies you in the planning process for your event and consults you on all technical aspects related to interpreting. First thing we find out what type of interpreting is expedient and adequate for your conference. As soon as you decided on the type of interpreting which works best for your event, we talk about the necessary interpreting equipment. 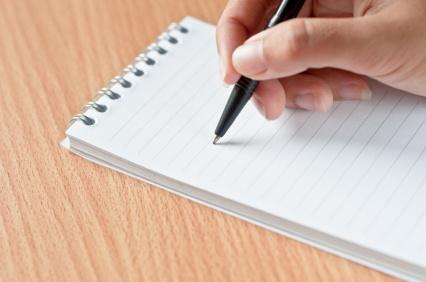 Every type of interpreting requires different technical equipment: the only devices needed for chuchotage (whispered interpreting), liaison interpreting, consecutive interpreting are a notepad and and a pencil. Classical simultaneous interpreting is all about interpreting booth, earphones and microphones. 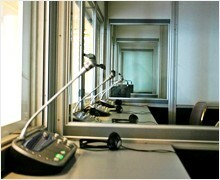 The interpreting booth is the soundproof workspace of the simultaneous interpreter. 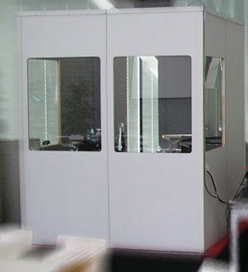 In the picture you see a mobile interpreting booth which can be installed in any conference room. The interpreters work in teams of two or three colleagues in the booths. The customer benefit: interpreting doesn’t cause any delay – and the interpreters melt into the background. The number of booths depends on the languages needed and on the space available. If several languages are used, the interpreters switch to the so-called relay interpreting – a simple example: at a conference interpreting is provided from German to English, French, Portuguese and Chinese. The speaker in the conference room speaks Chinese into German and is translated by the interpreters in the Chinese booth. The colleagues in the neighboring booths who do not understand Chinese, turn a knob on the interpreter’s switchboard and go from “Original” to “Relay” and then select the relay language; in our case German. Now they hear the translation into German and interpret into English, French and Portuguese. During simultaneous translation he interpreters use the switchboard with integrated microphone which is part of the interpreting booth. 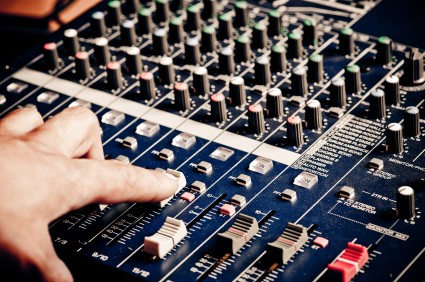 We use the switchboards of highly recommended manufacturers which ensure good sound quality and are compatible with the standard sound systems. Find informative articles about how an interpreting booth should or should not be equipped in our blog. Usually, the mobile booth is installed the day before the conference and is dismantled immediately after the end of the event. During the conference the equipment is operated by a specialist who ensures optimal sound for everybody. 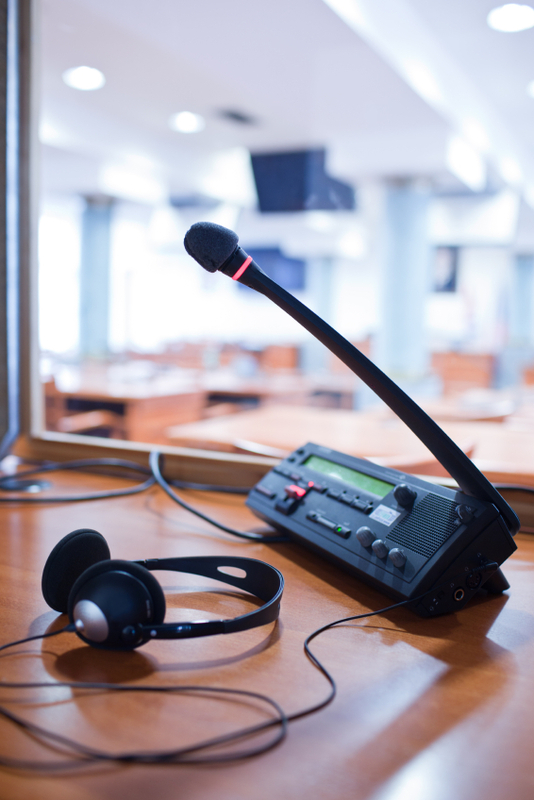 Mikrophones are an essential part of using conference equipment – by providing good sound to the interpreters radio or infrared connection and by helping to reinforce the speaker’s voice in the conference room. 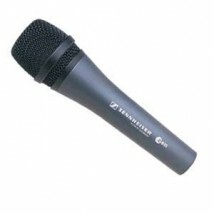 Different microphones are recommended, depending on the conference format. 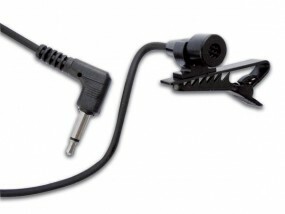 In this section you see a selection of the most frequently used microphone types: a hand-held microphone, a tie-clip microphone and a table microphone. Also, so-called neck-collar microphone are in use. For a conference that typically includes intensive discussions (e.g. 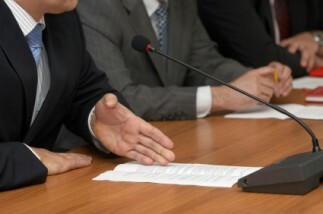 supervisory board meetings), table microphones are recommended. For longer presentations in front of a large audience the speakers will be typically equipped with a neck-collar microphone or a clip-on mikrophone, so that they can move around and use their hands freely. Some speakers prefer a lectern with a fixed microphone. If the agenda allows for brief discussions after presentations, microphones can be installed in the conference room. As an alternative, hand-held microphones are passed around in the audience. The spoken work is transmitted from the conference room via microphones and radio or infrared connection to the headsets of the interpreters who render what is being said simultaneously into the target language. Conference Consultancy Anna Mantel (Hartmann) works in good partnership with recommended and absolutely trustworthy conference equipment providers. It goes without saying that our equipment is integrated as far as possible in existing technical equipment of the conference venue (microphones, sound system etc.). Apart from the translation services provided by our interpreters in the interpreting boot we provide the whole range of conference-related technical services – one contact point for our customers! 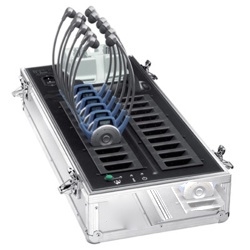 The interpreting equipment can be connected to an existing microphone or sound reinforcement system. The interpreting equipment can be integrated in show, light and sound installations. 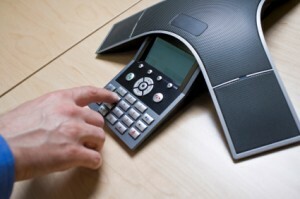 Multilingual telephone or video conferences can be organized in excellent sound and picture quality. The technician can make original sound recordings and provide the audio material on your preferred data carrier. This is also true for the translation provided. In this case the interpreters would have to assign the exploitation rights to their translation, which is subject to payment of an additional fee. The range of our services also includes interactive voting systems. During guided tours or plant visits a mobile system or a bidule can be used. This type of equipment is not suited for conferences. Do you intend to show a video clip or play an audio file? Would you like a speaker located at Houston, Texas to address the participants of your conference? Do you need to organize a video conference? Do you have a telephone conference in mind? Or do you have other requirements? Conference Consultancy Anna Mantel (Hartmann) will see to it! Let us be your single point of contact for all language-related services during your event. We will gladly go through the details via email, on the phone or in person.